Skillcase Analysis: Nate Pierre Louis left his national rep at home when it came time to work in the skill session. He went full speed and paid full attention to the instructors. 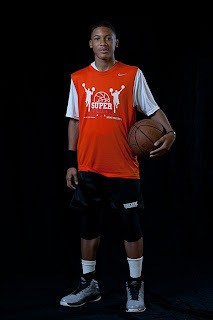 During game play showed why he should be considered one of the best scorers in America. He lit it up from all over the court and dropped some buckets using his off hand. Many scouts talk about his position but the fact remains that he’s a basketball player. After watching him this weekend a growth spurt is definitely on the way so the Class of 2017 needs to worry. He should see at least 6’4 which will be scary for the opposition.